Early 20th century, England. Arts and Crafts. 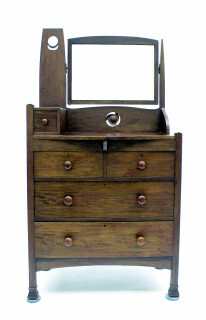 Produced by Robert Garnett & Sons, Warrington, Great Britain, established in 1824. Marked Riessner, Stellmacher & Kessel (RStK) of Turn-Teplitz, Bohemia (Austria), today the Teplice region of the Czech Republic, early 20th century. 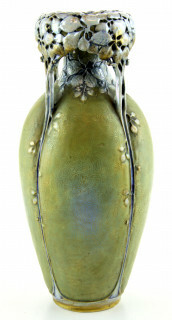 Of ovoid shape with an openwork wreath of petals at the rim, decorated with a glossy metallic luster glaze, the body with a gilt pattern on a green background and four vines down to the bottom rim. 1897, marked and dated. 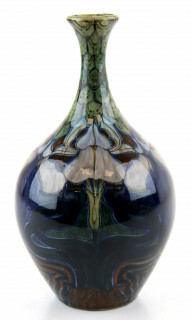 Moulded in a baluster shape with a slender neck and decorated with a stylised floral design on a dark blue and green background. 1897, marked and dated, painter Samuel Schellink. 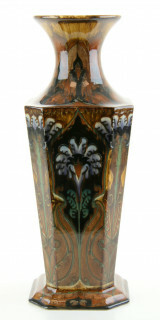 An octagonal baluster shaped moulded vase, painted with a floral design in brown, green, gray and black. 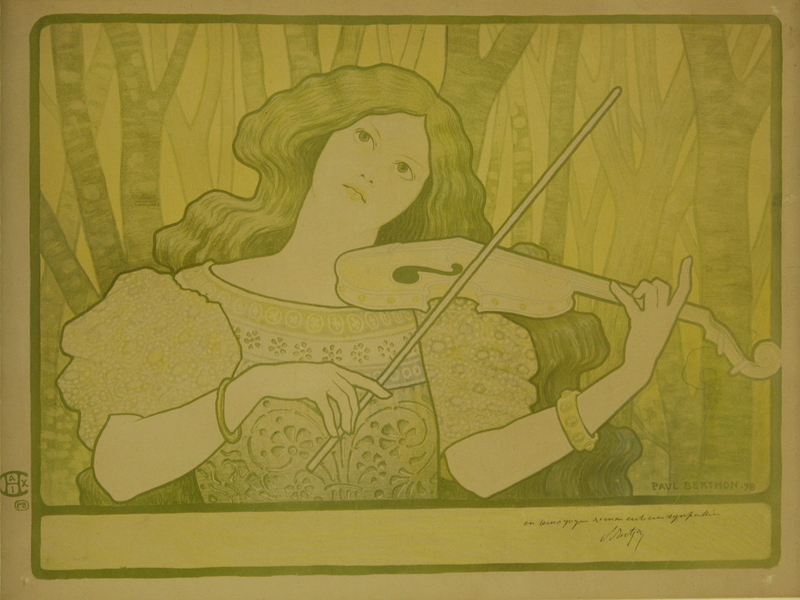 Leçons de violin Lithograph, 50x65 cm. 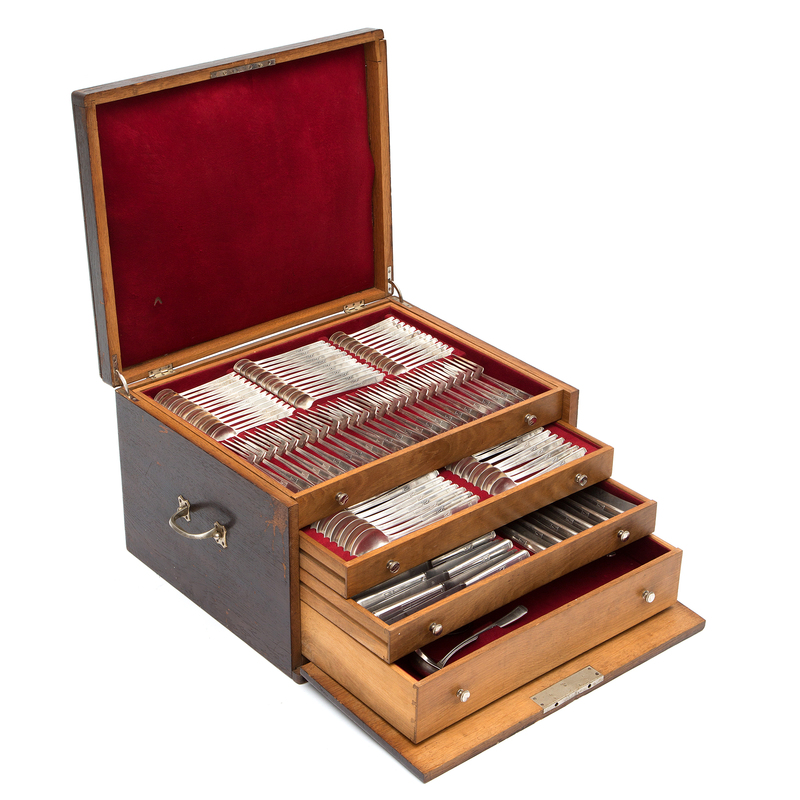 [MUSICAL INSTRUMENT] – HARMONIUM. 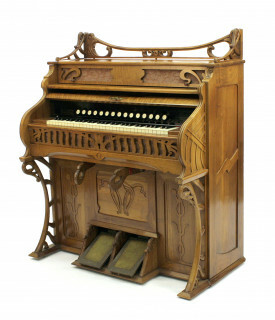 Worcester – Reed Organ, circa 1900. 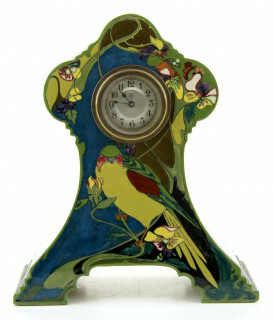 Eikenhouten kas met messing beslag uitgevoerd in Jugendstil. Met 15 registers en 5 octaven. Ca. 130 x 110 x 65 cm. Early 20th century, Italy. An Art Nouveau chair, ca. 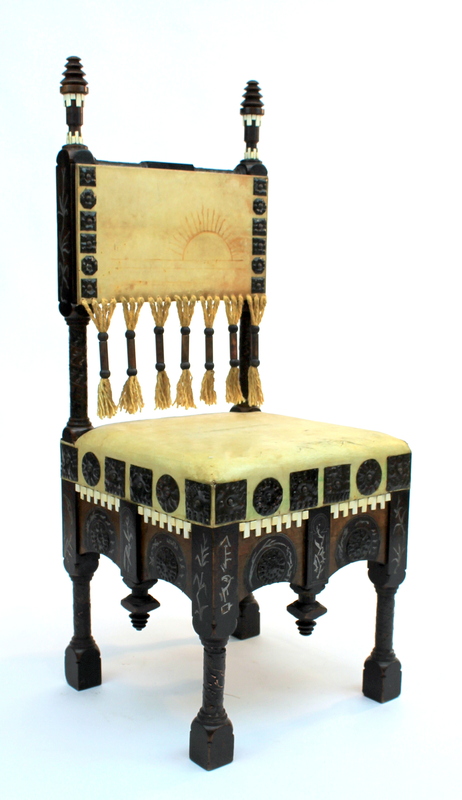 1902, made of ebonized wood with marquetery inlay of pewter, attached ornaments of hammered copper upholstered with vellum. With bone ornamentation and embellished with tassels (not original) at the back. Ca. 1905, design C.J. Lanooy, painter Philip van Praag, model number 23. 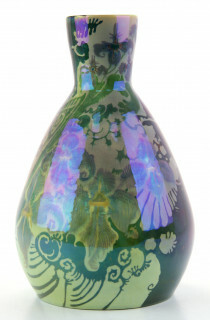 Moulded and painted with a floral Jugenstil design in green, yellow and aubergine with a lustre glaze. Ca. 1910, Austria. 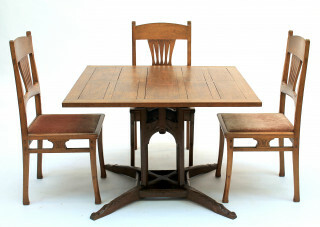 Four chairs and a table. Executed by: Österreichische Pressstoff Möbel Gesellschaft. 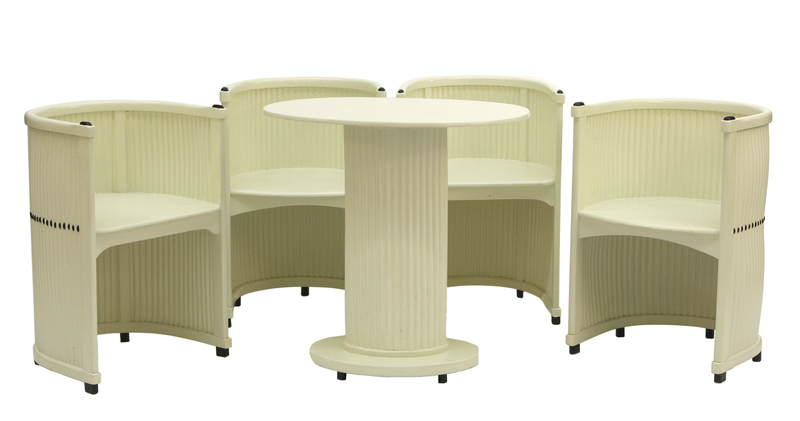 Made of white lacquered corrugated cardboard and beechwood with black lacquered details. 1909, Austria. A sideboard, a stool and a nightstand. Executed by: Österreichische Pressstoff Möbel Gesellschaft. 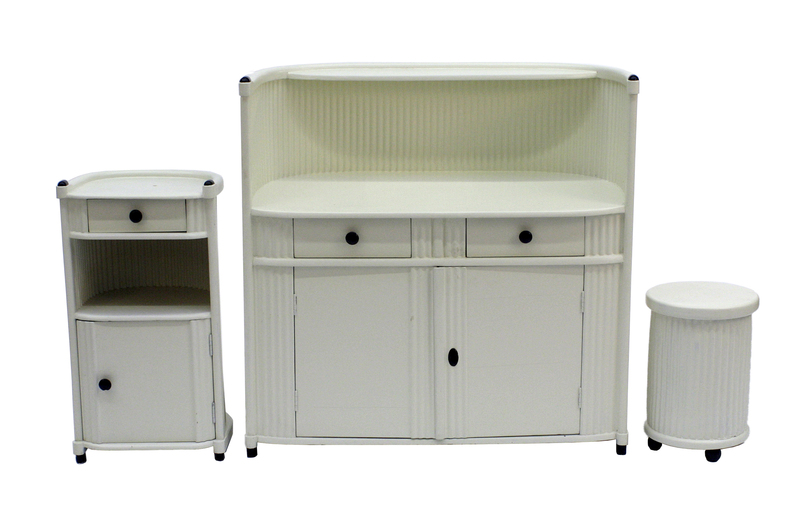 Made of white lacquered corrugated cardboard and beechwood with black lacquered details. 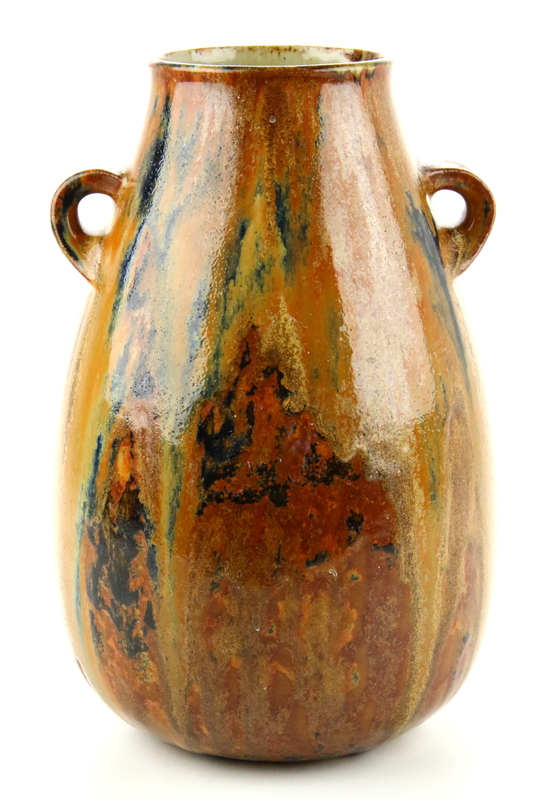 A design of Josef Maria Olbrich, with geometric shaped handle, J.O. designers' signature in rectangle and monogram BRS. Consisting of: twelve table spoons, forks and knives, twenty four dessert spoons and forks, twelve dessert knives with knife rests, twelve coffee spoons, twelve teaspoons, twelve long-drink spoons, a soup ladle, two gravy spoons, two vegetable serving spoons and a rice serving spoon. By Zwilling, Solingen, Duitsland, around 1900. 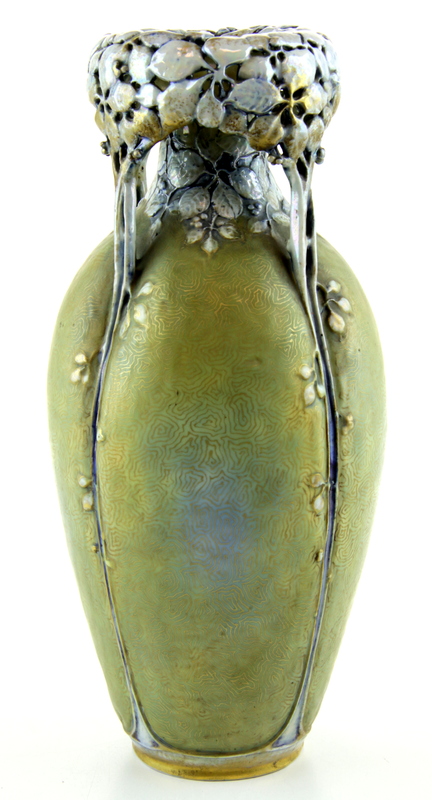 In the centre of the lid, in oval form, an engraving with the name "B. Razoux Schultz". Ca. 1899, The Netherlands. 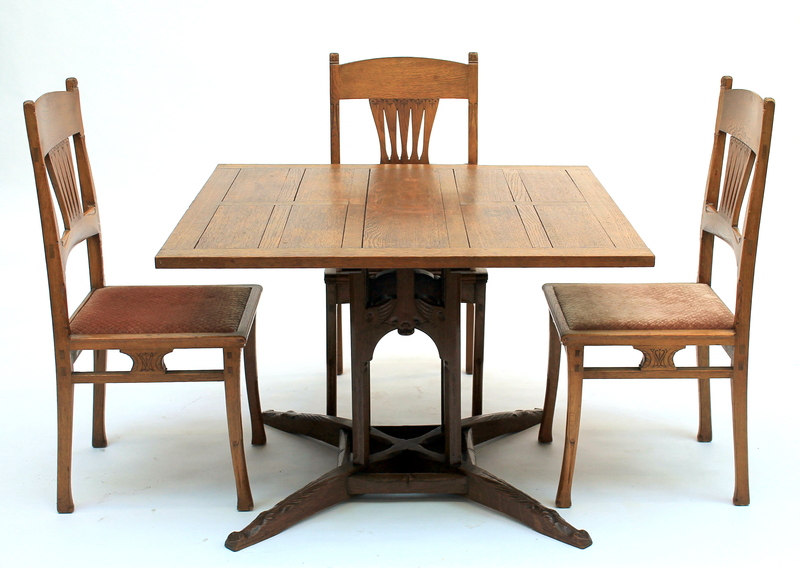 An extremely rare oakwood table and three matching chairs. The table decorated with carved crocodile feet, owl heads and fish, the back of the chairs flanked by two knobs shaped as small owl heads. Executed by: Meubelwerkplaats (cabinet-makers) E.J. van Wisselingh & Co., Amsterdam. 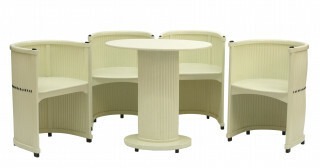 Furniture by Dijsselhof is extremely rare since he designed furniture only for a short period. 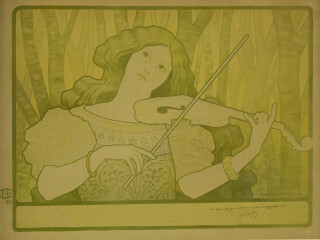 Provenance: bought in the mid-1980's by the present owner from the art gallery E.J. Wisselingh where they have been since the 1900's. Compare to: the Dijsselhof room in the Gemeentemuseum in The Hague, and: a similar table is in the collection of the Rijksmuseum in Amsterdam. Made for the world's fair "Exposition Universelle Internationale de 1900" in Paris depicting the exposition buildings, signed O. Roty for Louis-Oscar Roty, the designer of the “Semeuse” image on French silver coins and stamps, imperfect. 1901, marked and dated, painter H.G.A. Huyvenaar. Moulded model with a flat front and back, a floral design with a bird on a dark blue background, with a simple Junghans clock mechanism. Dutch Art Nouveau, 1903, designer J.C. Stoffels (1878-1952). Executed by the company 'Onder den Sint Maarten', Zaltbommel/ Haarlem. 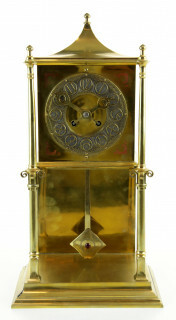 A brass table clock in a constructive style with two columns at the front, a roof shaped top and the dial with stylised numbers, the pendulum with a red stone, inspired by the works of architect H.P. Berlage and the designer Jan Eisenloeffel. Executed: 'Onder den Sint Maarten' in Zaltbommel/ Haarlem and marked: 'Onder den Sint Maarten'. Provenance: verbally communicated to have been part of the interior of the household of Mr. and Mrs. Roelofs-van Linden Tol, Amsterdam, traders in coffee. Ca. 1910, The Netherlands. 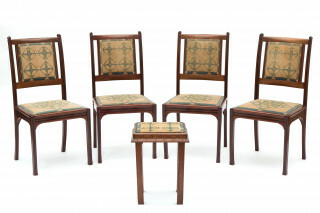 Four dining chairs and a stool (five pieces). 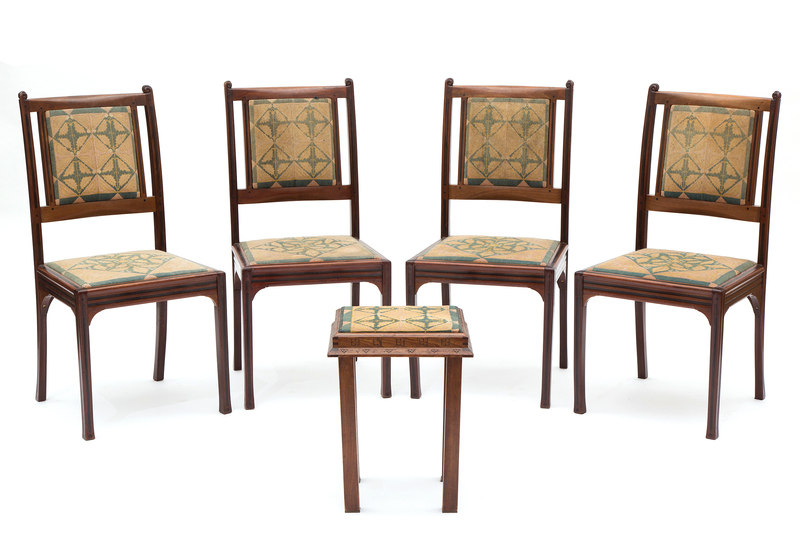 Mahogany, Macassar ebony with carved details and with original upholstery, designed by Theo Nieuwenhuis, executed: E.J. van Wisselingh & Co., Amsterdam. Provenance: verbally communicated to have been part of the interior of the household of Mr. and Mrs. Roelofs-van Linden Tol, Amsterdam, traders in coffee. Ca. 1910, The Netherlands. A tea table, made of mahogany, Macassar ebony, partially carved and with a loose tea-tray, designed by Theo Nieuwenhuis, executed by: E.J. van Wisselingh & Co., Amsterdam. Provenance: verbally communicated to have been part of the interior of the household of Mr. and Mrs. Roelofs-van Linden Tol, Amsterdam, traders in coffee. Ca. 1906, The Netherlands. 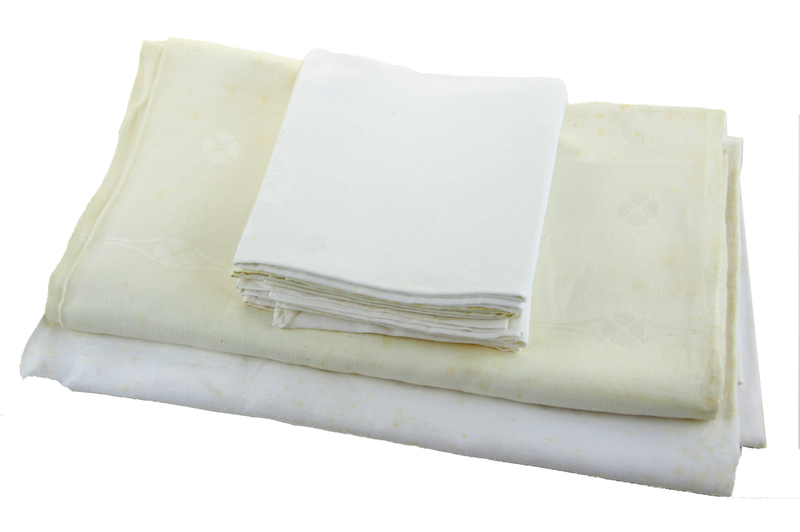 Two damask table cloths and seven napkins, with a design of geometrical ornaments surrounded by a band of butterflies, the napkins with embroidered monogram TS. Executed by: E.J.F. van Dissel Zn., Eindhoven. Ca. 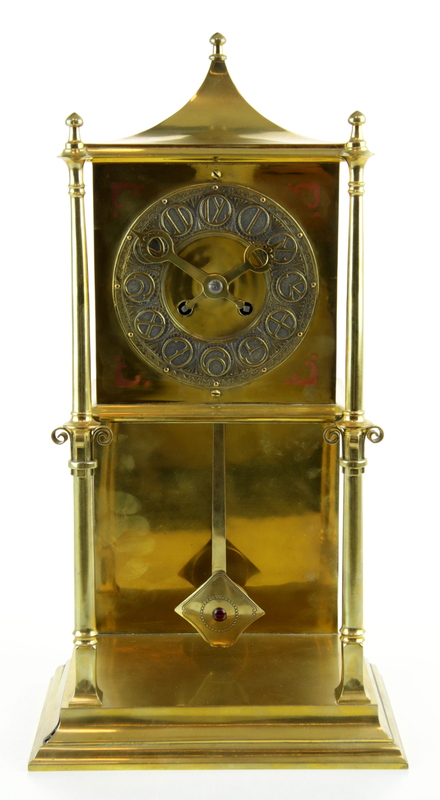 1900, France, marked and numbered 1031. 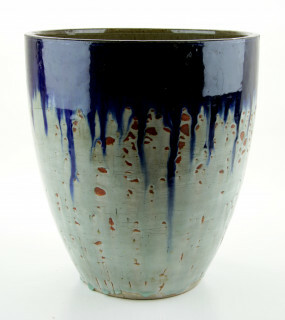 A wide pottery vase with a dark blue drip glaze on a green gray base. Ca. 1900, France, marked and numbered 6582. An ovoid pottery vase with two small handles and a crystalline flambé drip glaze. Ca. 1905, Plateelbakkerij Zuid-Holland, Gouda, painter J.v.D. 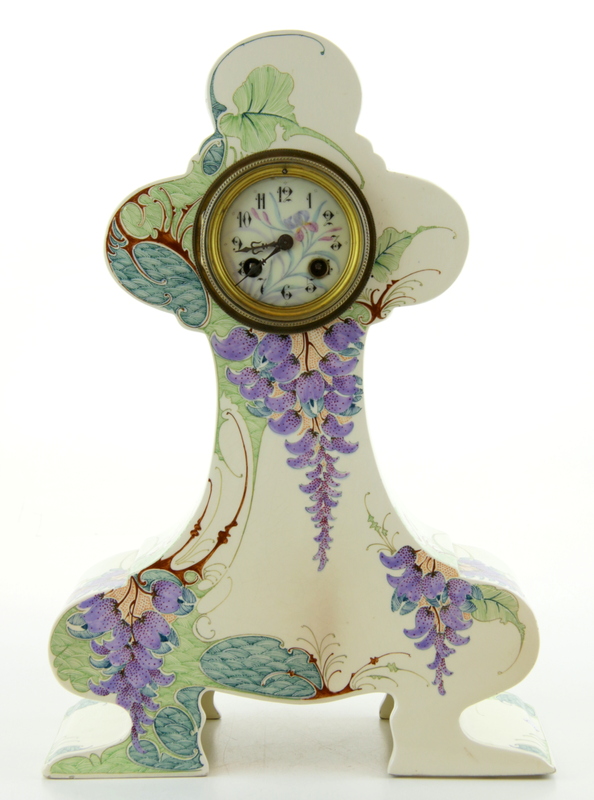 Moulded model with flat front and back, decorated with a stylised floral design on a cream coloured background, French clock mechanism with a hand painted white dial. 1903, Art Nouveau Plateelbakkerij Zuid-Holland Gouda. 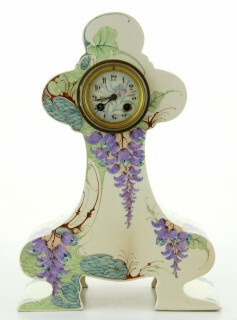 Trumpet shaped, with horizontal constrictions and decorated with a stylised floral design on a cream coloured background. A mantelpiece. 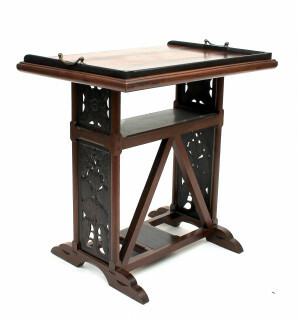 The top section with carved architrave shaped as circles, and geometrical carvings with inlay. The horizontal mirror flanked by profiled side panels. 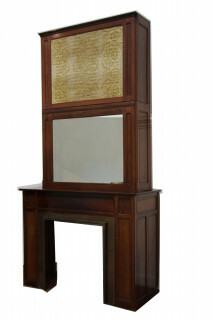 The lower section with an opening for the fireplace, surrounded by a brass frame and a wooden profiled frame with two carved corner rosettes shaped as crosses with inlay. Provenance: verbally communicated to have been part of the interior of the household of Mr. J. Schilt. 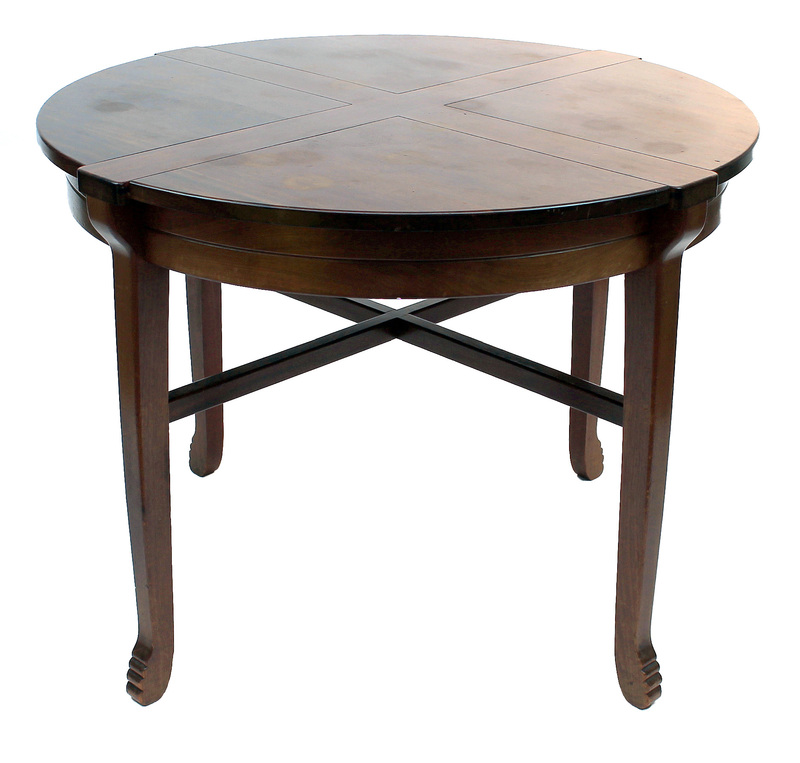 A round table, the table top with four sections, separated by a cross, with an architrave and four legs, joined by two crossing stretchers. (Some damages to the table top.) Provenance: verbally communicated to have been part of the interior of the household of Mr. J. Schilt.